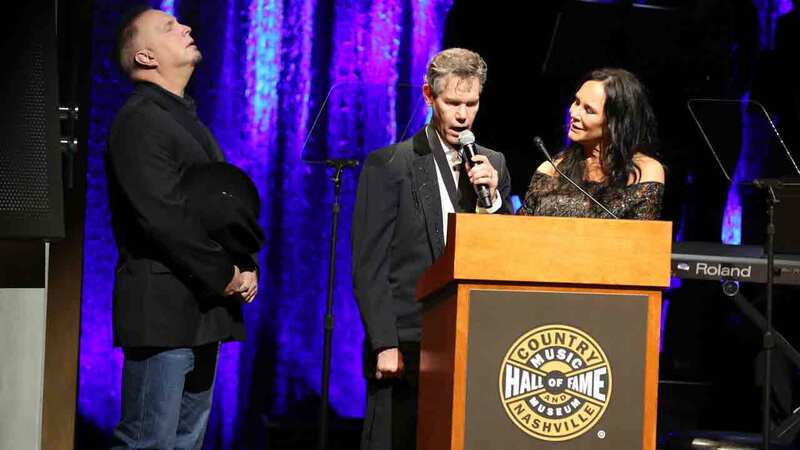 NASHVILLE, Tenn. -- Country singer Randy Travis found his distinctive voice three years after a life-threatening stroke and sang "Amazing Grace" during his induction Sunday into the Country Music Hall of Fame. The Grammy-winning baritone singer battled back from the stroke in 2013 to sing again during the medallion ceremony in Nashville, Tennessee. He was inducted along with fiddler Charlie Daniels and record producer Fred Foster. Fellow artists including Kris Kristofferson, Dolly Parton, Alan Jackson, Brad Paisley, Garth Brooks and more honored the three inductees with musical tributes. But it was Travis' singing that brought a stunned silence and tears to the crowd after years of rehabilitation and therapy to regain his voice. Mary Davis-Travis, his wife, spoke about the numerous procedures and surgeries to save his life and a six-month stay in the hospital after a viral infection caused his stroke. "Randy stared death in the face, but death blinked," Davis-Travis said. "Today God's proof of a miracle stands before you." The 57-year-old singer was honored for being the first country artist whose debut album "Storms of Life" went platinum in its first year and he ushered in a wave of neo-traditional singers like Alan Jackson, Clint Black and Brooks in the 1990s. Jackson, who performed "On the Other Hand," talked about going out on tour with Travis in the early '90s and compared him to Elvis. "When he sang, the women were screaming and fainting and it was crazy," Jackson said. "I loved it. Someone singing real country music and having that effect and selling all those records, it just made me so happy." Daniels, the fiddler player behind the hit song "The Devil Went Down to Georgia," was honored for his multi-genre style blending Southern rock, bluegrass, gospel and country music. "A plaque on this wall is not just another award or accolade," Daniels said. "It's a page in a history book. An unending history book." Jamey Johnson performed his song, "Long Haired Country Boy," while Trace Adkins performed "The Devil Went Down to Georgia," with fiddler Andrea Zonn. Foster ran the influential Monument Records, which helped launch the careers of Roy Orbison and Willie Nelson as well as Parton and Kristofferson. Kristofferson sang his iconic song "Me and Bobby McGee," which Foster helped co-write and produce, while Parton sang "Dumb Blonde," from her debut album produced by Foster. She praised Foster for giving her a shot and still being a gentleman when Porter Wagoner stole her away to be on his television show. Vince Gill presented Foster with the medallion and noted Foster was a lover of great songs and a champion of unique singers. "But everyone of us needs a champion," Gill said. "And you look like at a man like Fred Foster and there's a man that has been a champion for all these years." The 85-year-old producer is still currently working and most recently produced a tribute album to Ray Price by Nelson.